A former billboard company employee in Tallahassee, Florida has revealed that billboard companies intentionally poison trees that block their billboards from view. 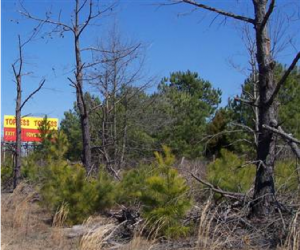 Robert Barnhart, a former crew chief for Lamar Advertising, stated in court filings that he was instructed to poison trees located on private property not belonging to Lamar if they were too big to be pruned or cut back, and blocked Lamar’s boards from view. In a court filing (pdf), Barnhart states he was instructed to wear nondescript clothing without any logos, drive to the area of the offending tree in a truck without Lamar logos, park several blocks away from the offending tree, walk over, use a machete to hack into the root system surrounding the tree’s base and pour herbicide onto the roots. The herbicide was kept in containers marked “AC Cleaner.” Barnhart said he was instructed to do this at least seven times. The actions violate numerous laws and constitute criminal mischief, trespassing, and violation of environmental laws regarding dumping of poison on land. After Barnhart provided his employer with a written objection to the offensive practice, he was subsequently threatened with termination and then fired. It wasn’t Lamar’s first such offense, either. In 2010, Lamar was found liable for trespassing and killing 83 trees along Interstate 84, and in 2009 Lamar was ordered to pay about $182,000 to a couple in Ohio for killing 34 trees on their property to improve views of their billboards. Lamar owns approximately 146,000 billboards in 44 states.